I just finished reading THE PHANTOM PILOT and it was such a great book! It’s a fast read and beautifully written. The characters are interesting and compelling and in Ann Swann’s heroine, “Stevie,” we meet a dynamic character who reminded me of a young Katniss Everdeen from The Hunger Games (sans the emotional instability and psychosis!). The book zips along and is exciting and scary at times and has a really great ending. I recommend this for all ages. Really looking forward to reading more of Ann’s work! 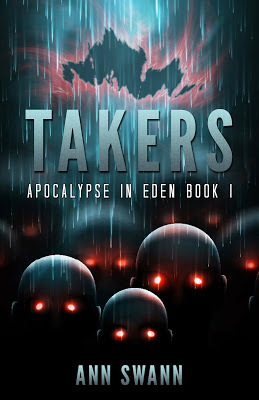 Until the moment the sky splits open and spews an infected rain of Soul-Takers into his small Texas town of Eden, Jack Lewis is just like any other ordinary fourteen-year-old boy. His biggest worry is whether the cute girl with the sparkly blue hairband will dance with him at the end-of-school dance. But as each viscous drop of infection hisses off the pavement, more and more Takers appear. With his deaf pit bull, Snake, Jack begins a journey that is as much inward as it is cross-country. But will he be able to avoid the cannibals long enough to find his family, or will he find himself like the rest of the citizens of Eden, stabbed onto a tree branch with his guts spiraling out below? That’s how the Takers bleed their food before they eat it. Before they ingest their victims’ bodies and souls . . .
Ann Swann was born in the small West Texas town of Lamesa. She grew up much like Stevie-girl in The Phantom Pilot series, though she never got up the nerve to enter the haunted house like her series character did! Before becoming a writer, Ann did everything from answering 911 Emergency calls, to scheduling commercials in a rock-n-roll radio station, to teaching elementary school. She still lives in Texas with her husband, Dude, and two rescue cats, Oscar and Mojo. When she’s not writing, Ann is reading. Her to-be-read list has grown so large it has taken on a life of its own. She calls it Herman.